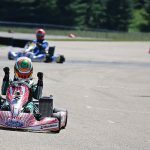 The second event of the 2016 United States Pro Kart Series host the third round of the championship program under bright sunny skies of Shawano, Wisconsin. US Air Motorsports Raceway is a destination track, and one that separates the good from the bad. From qualifying to the last checkered flag, it is about being quick, managing your tires, and hitting your marks lap after lap. Saturday’s round of racing produce some exciting moments, repeat winners and a couple first time victors. From the opening lap of the day, we knew it was going to be a fun and exciting round of racing in Comet Racing Engines Yamaha Pro division. It went down to the wire with four drivers in the hunt in the end. Top qualifier Zach Holden (Tony Kart), heat race winners Dakota Pesek (Top Kart) and Brandon Lemke (Merlin) along with veteran racing Kevin Nelson (Tony Kart). Each took a turn at the point with Nelson as the driver on the move late. Pesek was leading with Nelson attempting to take the position away on the final lap. The group bunched up going into turn four at the bottom of the paddock hill, and Nelson got the brunt of it getting sent off track. This gave Pesek enough room cruise to the victory, his second of the season. Holden crossed the line second, but was penalized for the contact with Nelson. A protest was filed and then overturned the ruling, reinstating him to the podium in P2 ahead of Lemke. Alexander Kardashian (Top Kart) trailed the lead group all race, placing fourth with Collin Griffin (Tony Kart) a solid fifth. 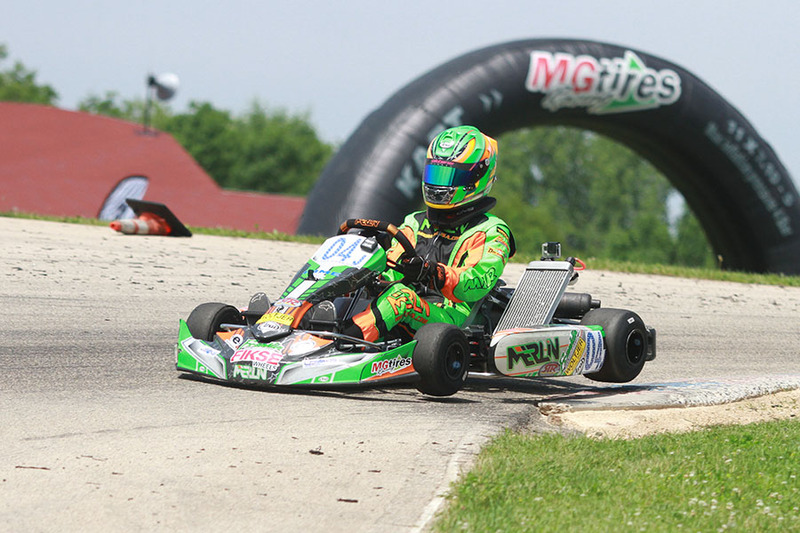 Holden moved up one step later in the day when the Comet Kart Sales driver drove to the victory in Franklin Motorsports IAME Pro. Brandon Lemke (Merlin) was on the pole position having swept qualifying and the two heat races – and launched away from the field in the opening laps. Mike McAndrews (Fullerton) started outside the front row, eventually slipping down after Holden and Brandon Jarsocrak (Praga) worked past. Little by little, Holden reeled in Lemke and by lap 13 was there. Zach made his winning move at the end of the wood-straight, sliding around at turn five the following lap and never looked back. 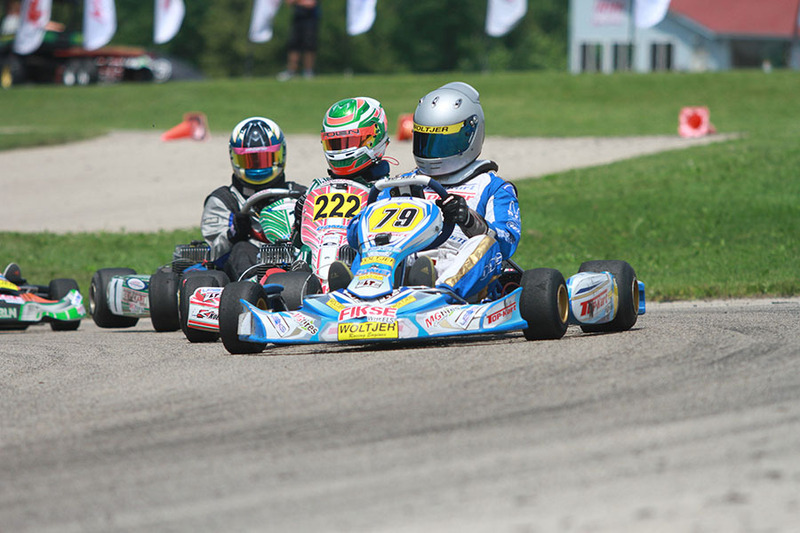 Lemke came under pressure from Jarsocrak, with the point leader holding off the KartSport North America driver to the checkered flag. AJ Myers (iKart) drove to the fourth position until he was removed from the results for a detached airbox. That promoted McAndrews to fourth for his best finish of 2016 in fourth, and for Ryan Norberg (Tony Kart) placing fifth. Andrick Zeen (Praga) came from 19th to sixth, working by Jonathan Kotyk (Top Kart) late in the race. Robby Seward (Birel ART) was classified in eighth ahead of CompKart drivers David Ilavia and Austin Garrison. The Junior categories was a Merlin sweep with Alex Bertagnoli and Sam Mayer taking the top honors. The Innovative Performance IAME Junior class began with Myles Rowe (Tony Kart) as the driver to beat, sweeping qualifying and the two heat races. Rowe would be shuffled back on the opening lap with Austin Schaff (Merlin) coming from third on the grid to lead the opening laps. Bertagnoli (Merlin) started eighth having a broken chain in Heat #2 hurt his starting position, and quickly worked his way into the top-five. The Round One winner didn’t take long and was into the lead by lap four. Rowe followed him through but Bertagnoli kept a gap large enough to not feel pressured by the top qualifier. Rowe closed late, just not in time with Bertagnoli taking his second checkered flag of the year. Rowe recorded his best finish of the year with the runner-up result. The battle for third went to the final lap with Schaff holding the position until retiring early. That promoted Lance Fenderson (Tony Kart) to his second podium of the season. Stephen Dial and Sam Mayer brought the Merlin total to three inside the top-five. The front three grid positions were held by Merlin drivers for the Woltjer Racing Engines Yamaha Junior main event. Heat #1 winner Alex Bertagnoli and top qualifier Sam Mayer held the front row with Austin Schaff in third. They were joined at the front of the field by Junior rookie Aidan Harrington. Bertagnoli led early until Mayer assumed the top spot, pacing the lead group. Schaff put pressure on Bertagnoli late, taking over the second position and looked ahead to Mayer. On the final lap, Schaff tried an inside move at the hairpin. It was a late maneuver and nearly spun sideways trying to not take out Mayer. The two continued and Schaff quickly regained his composure, then took another shot at the coming into the penultimate corner. He went in too deep, and spun the kart around. At the same time, Harrington made a pass on Bertagnoli, stealing the second position. Taking the checkered flag was Mayer, his first in the category and third different winner in has many rounds. Ben Varner (Merlin) and Dillon Schwanbeck (Tony Kart) slid past Schaff to drop him to sixth. Benik drivers Tyler Maxson and Reece Gold were the top two contenders in Allison Racing Engines IAME Cadet class. Maxson was the top qualifier and won the second heat race after Heat #1 winner Gold fell to 12th in the final lap of the second moto. Gold started fifth in the main event with Maxson on the pole position. Maxson set the pace early with Gold into the second position by lap two. Reece assumed the top spot on lap seven, and kept Maxson at bay to earn his second straight victory in the category. Rylee Engel (Tony Kart) made a great move in the final corner to secure the third position on the podium over Nicholas Terlecki with California’s Colin Queen (Tony Kart) right there in fifth. Kaden Wharff increased his championship hopes with a third straight victory in the Switch Racing Engines Yamaha Cadet class. 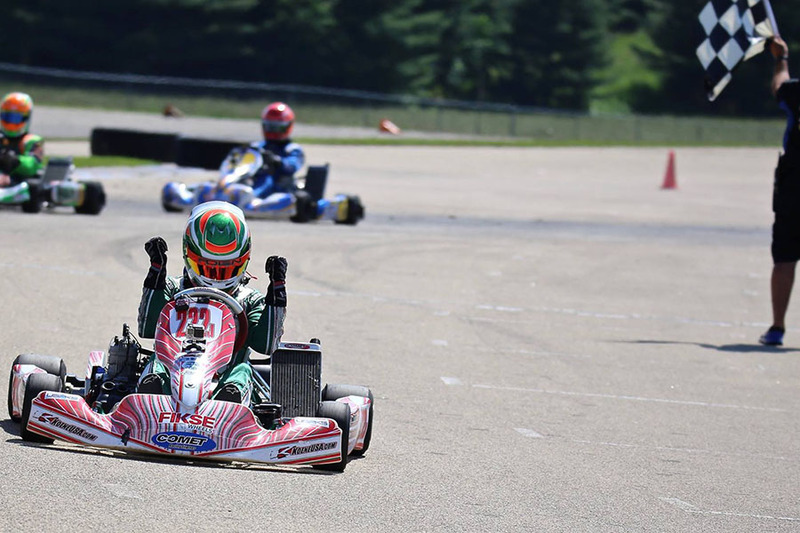 The Top Kart driver swept the action on the day, securing the feature victory by nearly two seconds. Garrett Adams (FA Kart) was close early on, losing the draft toward the end. The battle for third went down to the wire as well with Kyle Thome (Merlin) taking position. Caleb Bacon (CompKart) and Friday Happy Hour top driver Zane Maloney (Tony Kart) rounded out the top-five. Motorsports Driver Development IAME Rookie was under control by Brent Crews all day. Crews (Energy) was dominant all day, driving to near eight second victory. The battle for second was exciting all day long with Danny Dyzelski (Kosmic) earning the position over Eli Trull (Top Kart), Paige Crawford (Tony Kart) and Elliot Cox (Benik). Elliot Cox (Benik) went undefeated in wheel-to-wheel action today in the QPS Employment Group Yamaha Rookie division. Cox led wire-to-wire in the main event after winning both heat races for his first victory on the season. Danny Dyzelski (Kosmic) ran to second with Eli Trull (Arrow) completing the podium. 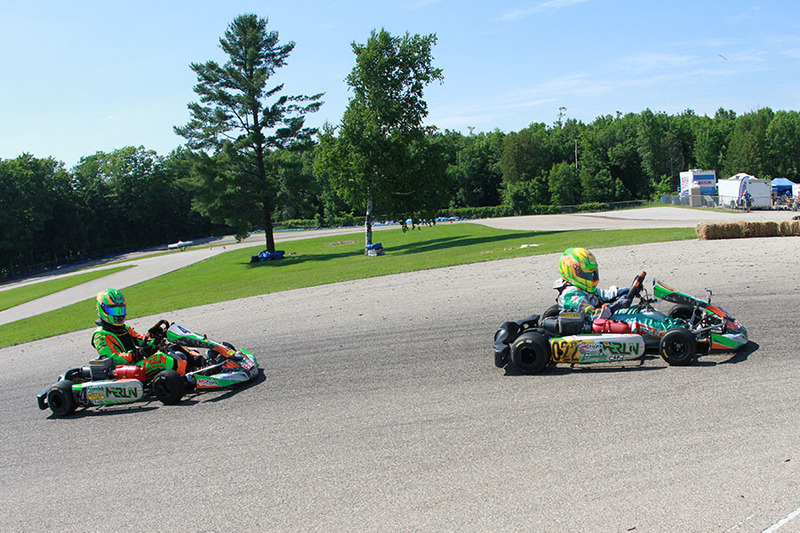 Top qualifier and double New Castle winner Paige Crawford (Tony Kart) finished fourth ahead of Christian Gordon (Arrow).